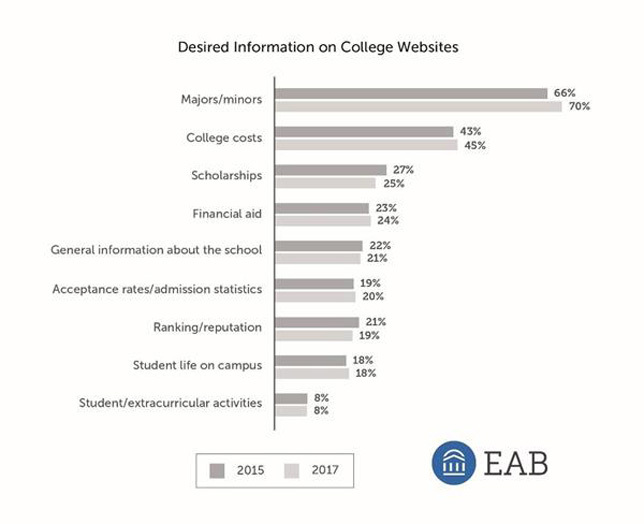 When searching for information on colleges, prospective students are most interested in information about specific majors and minors, according to a new survey from research company EAB. The study polled nearly 5,000 freshmen enrolled at more than 900 four-year colleges and universities about their college search, communication preferences, on-campus experience and more. Seventy percent of respondents said they primarily searched college websites for information about majors and minors, compared to 19 percent who wanted to know about a school's ranking or reputation. Forty-five percent of respondents were looking for information about college costs, and 24 percent wanted to know about financial aid. EAB noted that the number of students seeking information about academic programs has grown by about 4 percentage points over the last two years. The desire for other types of information (cost, financial aid, reputation, etc.) has remained constant or decreased slightly. "There's no doubt that rank and cost are important to students and families, but these survey results suggest that students are also focused on value and whether their degree will enable them to succeed in their chosen profession," said EAB principal Dana Strait, in a statement. "The survey findings affirm what our research team has been hearing from the hundreds of enrollment leaders we speak with: Students are evaluating what we call ‘return on education' or ROE. And ROE has a lot to do with their field of study, not just the school they select or the price they pay." Fewer students looked to a school's social media channels for information about college costs (31 percent) and financial aid (26 percent). "Since the Great Recession, students have become more practical and career-focused when choosing schools. And our research suggests that this trend is likely to continue," Strait said. "Still, many schools don't provide prospective students with enough information on the experiences, opportunities, and outcomes students will have in individual programs." The full survey is available for download on the EAB site (registration required).